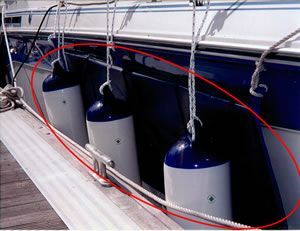 Often boaters find they need an extra layer of protection between their hull and their fenders. At Compass Marine we can offer products such as Fender Blankets & Cushions that ensure a clean side remains against your boat at all times. We also offer Anti-Scuff Sleeves that protect your topsides from line and rope abrasion. Fender Cushions and Blankets are the best products to protect your hull from dirt on your (or other people's!) fenders. Heavy-duty Anti-Scuff Sleeves prevent scuffing from ropes and lines against your hull and top sides.